Time to be tactical with Greninja (Detective Pikachu 9/18)! This is actually a Secret Rare since the star is silvery according to the card, so good luck pulling one! There used to be a YouTube video from PTCGradio about this card from a different language, but was removed swiftly, so I couldn’t get the details before, but since PokeBeach eventually revealed the English scans at a later date, I can finally get to analyze it. Being a Stage 2 is pretty slow, as it takes two turns to evolve outside of Rare Candy or Meganium’s Early Ripening Herb ability as well as devoting more deck space for those evolutionary pieces. The Water typing allows Greninja to hit most Fire types and some Fighting types for double damage, as well as tapping in on support from both formats. Anti-Water cards exist in the form of Parallel City and most of the BW-era Grass types have Water Resistance. 140 HP for a Greninja card is higher than previous Greninja cards sans the one from Kalos Starter Set (that one has 140 HP), though the Grass weakness can still be a problem, and there are some decent grass decks going around. Even then, the threshold for 2HKOs has increased due to the advent of Tag Team cards. Decks would want to constantly deal 150 damage to secure it, meaning it’s a OHKO from even neutral attacks for Greninja! A retreat cost of one is okay; you could fork over an energy most of the time or use Escape Board to eliminate it. Greninja has an ability and an attack, both of which seems extremely familiar from various past cards. Evasion Jutsu is quite iffy, as it creates a scenario of whether it be completely useless or utterly broken. When this Pokémon is about to be damaged, you flip a coin. If heads, prevent that damage! This can happen even if it is on the Bench and even if it comes from your own attacks like Zapdos’s (XY Roaring Skies) Raging Thunder for instance. It does not, however, prevent Special Conditions or effects that place damage counters, so Greninja is not entirely safe. Another thing you can’t cheat on is that Victory Star Victini does NOT allow you to re-flip a coin for Abilities, only attacks. Furious Shurikens is also another familiar attack on a different name, as it cost WW and does 50 damage to 2 of your opponent’s Pokemon. This can help set up multiple KOs, and I don’t see any restriction regarding targeting, so you can hit the Active, and Weakness/Resistance will be applied to it. All in all, this seems to be a standalone card that doesn’t need much support, and you can use whatever cards to speed up the process even further. But sadly, having a 50/50 ability and a mediocre spread attack doesn’t make this a great card……..for Standard at least. Plus, there was another Greninja card from Japanese’s Night Unison set to compete with. It is a Stage 2 Dark Type with 130 HP, weak to Fighting, Psychic Resistance, and free retreat. Bring Down cost CC and makes you choose one Pokémon with the fewest HP remaining except this Pokémon, and that Pokémon is knocked out. Mist Slash costs DD and does 70 damage, without being affected by Weakness, Resistance, or any other effects on the Defending Pokemon. Expanded could shake things up for this Greninja because of the format’s vast card pool. There are several more Greninja options and even a card that has another Stage above it! Greninja (XY Kalos Starter Set 14) is a Stage 2 Water type with 140 HP, weak to Grass, retreat cost of one, and two attacks. May Block costs W for 40 damage and requires a coin flip. If heads, you discard an Energy attached to your opponent’s Active Pokemon. Aqua Edge is overpriced; 80 damage for WWC isn’t going to affect the majority of Pokemon that frequently see play, and even if you can KO something with this attack, having three energy on one Pokemon may be too much. While this card looks like pure filler compared to the rest of the options that I’m about to go through, it comes a little closer to supplement Greninja Break. Greninja (XY Black Star Promos 24) is a Stage 2 Dark Type with 130 HP, weak to Fighting, resist Psychic, retreat cost of one, an Ability, and an attack. Mist Concealment works when you put this card to evolve one of your Pokemon. You get immunity from damage and effects during your opponent’s next turn. This effect still works even if it’s on the Bench. Break Evolving won’t trigger Mist Concealment because it was already in play from the previous turn. Even though this ability is a one time deal, it is still enough to safely Break Evolve on the next turn, as opposed to the Stage 2 being KOed before you have a chance to evolve. Shadow Bullet costs DC and does 60 to the Defending Pokemon and 20 damage to one of your opponent’s Benched Pokemon. Whereas this attack would’ve been pretty good in much older metagames, it is pretty lacking now. Though insignificant, I would mention that this card (XY24) is pretty broken in Unlimited due to combos. Frogadier (SM Forbidden Light), Greninja (XY24), Greninja BREAK, Broken Time Space, Scoop Up Cyclone/Super Scoop Up, Lysandre’s Trump Card, Puzzle of Time…these cards make it so that you have a continuous loop on placing damage counters while being immune to everything. Yeah, I wouldn’t want some of those cards to come back. Then we get to better options! Greninja (XY BreakPoint 40/122) is a Stage 2 Water type with 130 HP, Grass weakness, and free retreat. It has two single energy attacks. Shadow Stitching costs C for 40 damage, and provides a one turn lock of disabling Abilities from your opponent’s Pokemon in play, hand, discard pile, and even cards that come into play from their deck! Moonlight Slash costs W for 60 damage, and does 20 more if you return a water energy attached to it into your hand. You could easily snag a couple copies from the Wave Slasher theme Deck. Greninja (XY 41/146) is a Stage 2 Water type with 130 HP, Grass weakness, and a retreat cost of one. It has an ability and an attack. Water Shuriken is an ability which lets you discard a Water energy from your hand and place 3 damage counters on one of your opponent’s Pokemon. Mist Slash costs W for 50 damage without being affected by Weakness, Resistance, or any other effects on the Defending Pokemon. Here’s an extremely dated review of this card. Greninja (XY Black Star Promos 162) is a Stage 2 Water type with 130 HP, Grass weakness, and a retreat cost of one. It has two attacks. Aqua Shower costs W and does 20 damage to each of your opponent’s Pokemon. Dual Cut costs WC and flips two coins; it does 60 damage for each heads. You could previously find these from the Checklane Booster Pack from XY Evolutions. And finally, there’s Greninja BREAK (XY BreakPoint 41/122)! This is a Break Evolution of a Stage 2, which is even slower than an ordinary Stage 2, as it takes even more cards in your deck slot and even four turns to evolve. It is a Water type with 170 HP, and maintains the attacks, abilities, weakness, resistance, and retreat cost from your previous Evolution. So it may be weak to Grass or Fighting, or it may have Psychic resistance, and it may or may not retreat for free. It adds an ability called Giant Water Shuriken. If this Pokemon is your Active Pokemon, then you may discard a water energy from your hand and place SIX damage counters on one of your opponent’s Pokemon. This is one serious snipe, as it takes out 60 HP Pokémon, which would’ve been used to evolve, or just sit there as a tech against other stuff. It even helps to make the other player using Professor Elm’s Lecture to grab more than one of the same Pokémon for the sake of getting at least someone to evolve when one of them goes down. Ditto Prism Star may be out of luck even for one turn if Greninja Break is already in play, because that player will simply use that ability to KO it and send it to the Lost Zone. You can read past reviews here: a regular review and the second best card of 2016. This card was placed 22nd place for the top X cards lost to rotation in 2018. It’s overall playability drifts in and out over the years. It has seen a lot of play back then, racking up multiple placements in various tournaments and even place highly at three different World Championships. Worlds 2016 had Greninja Break decks placed as high as second for Masters Division; World 2017 had second place on Senior Division; and Worlds 2018 had placed fourth place in Senior Division. Greninja BREAK haven’t seen any placings lately while looking at Limitless; the World Championship 2018 decklists are its latest appearances for this golden frog, and it’s best days are going to be numbered. Despite that, this is still a good card which can still catch opponents off guard if you get it fully set up. It may seem hard, but there is Frogadier (XY BreakPoint 39/122) whose Water Duplicates can fetch three more Frogadier from your deck into your Bench, ready to evolve next turn. It helps to use Rare Candy (which no one did in Greninja Break decks) in case one of your Frogadier is prized or if one of them gets Knocked Out. Other Pokémon that supported Greninja Break includes Starmie, whose Space Beacon acts like pre-errata Energy Retrieval. Talonflame (XY Steam Siege) was used in the early days to get the cards you’ll need via Aero Blitz while being able to be place in the Active when you’re setting up to play. Tapu Lele-GX is there for fetching Supporters and Tapu Fini-GX is teched in Greninja decks for its Tapu Storm GX attack. Espeon-EX was also included for devolving multiple Pokémon for KOs as opposed to applying the full damage. Overall, it was a deck archetype that was once deemed inconsistent but was able to make it work. So, is the new Greninja going to supplement Greninja BREAK, or is it going to be brushed aside? Well, Evasion Jutsu isn’t reliable enough to help its longevity outside of players cheating to get heads on every coin flip (don’t even bother with whatever tactic you have, it’s time consuming and even the Judge may cease the match and disqualify you). Furious Shurikens needs two energy, and with most Greninja BREAK running between six to ten energies, there’s not much time or room to invest. The retreat cost of one is considered an irritant because with free retreat, you can use Giant Water Shuriken multiple times for multiple Greninja BREAK in play. Escape Board eats up your tool slot for a specific Pokémon when it could’ve been Choice Band or Bursting Balloon. Suppling snipe with spread may be useful, but not enough to deal the biggest blow to whatever is in front. However, if you can’t get more than one Greninja BREAK in play, then a last resort of stall, snipe, and spread would be your alternative. For the most part, it doesn’t seem to help Greninja BREAK as much. And we haven’t get to other factors like Giratina shutting off abilities with its Devour Light ability or Garbodor’s Garbotoxin, which could stop stall tactics cold. You can’t use this in Limited play, mostly because it is a mini-set. And even if you can, there’s no Froakie and Frogadier in that mini-set. Greninja doesn’t seem to do anything noteworthy in either formats, except that it made me write a lot due to being a non-GX Stage 2 Greninja card, which doesn’t seem much in Standard, but means a lot on Expanded because an archetype dedicated to Greninja cards exists. You may be able to steal a win that you shouldn’t have. Effects like this is pretty tempting, but you’ll be disappointed if you expect your luck to push very hard, and even more so in PTCGO, where the computer will flip a coin for you (it could flip tails every time). Overall, Greninja is not much different than many other past cards in terms of its ability (like Cincinno BW Next Destines or even the new Whimsicott-GX) that did a similar thing. Note: This review went up about 30 minutes late. My apologies; hopefully the length and number of things we had to address makes the delay understandable. We’re looking at Greninja (Detective Pikachu 9/18), one of the tie-in cards for the upcoming Detective Pikachu film. These cards are only available in special booster packs available with various Detective Pikachu-themed gift sets. Being a Stage 2 means it is a bit slow to hit the field, though it becomes easier in Expanded due to Archie’s Ace in the Hole or Frogadier (XY – BREAKpoint 39/122). The former would let you Bench a Greninja directly from the discard pile if you can meet all its conditions, while the latter has an attack that searches your deck for and then Benches as many cards named “Frogadier” as you can and want. The former has worked with certain [W] Types, but Greninja decks usually go with the latter. They aren’t an option at all for Standard, but we’ve seen Greninja-GX enjoy some success backed by Meganium (SM – Lost Thunder 8/214) and less (but still some) success with Frogadier (SM – Forbidden Light 23/131). This Frogadier offers no Evolution acceleration, but when you play it from hand, its “Gale Shuriken” Ability triggers and you may place two damage counters on one of your opponent’s Pokémon. We’ve even got a decent assortment of Froakier, at least if we’re grading on a curve as Basics in Stage 2 Evolution-lines are usually little more than filler; even in Standard you have one with low enough HP to work with Professor Elm’s Lecture, or the new going rate of 70 if you’re not using that Supporter. In video games, Greninja are Water/Dark-Types, but we’ve only had one [D] Type Greninja released in the TCG and this Greninja… doesn’t change that, as it is a [W] Type. In order of relevance, that’s the better Typing in terms of both current and near-future Weakness exploitation, support, and avoiding Resistance plus Type-specific counters. 140 HP is around the point where surviving an attack becomes a little more likely than not; it at the lower end of what is typical for Stage 2 Pokémon. Which means this card is neither fragile nor durable, at least just when considering HP alone. The [G] Weakness does this card no favors, but the only good Weakness is no Weakness, and [G] Weakness is safer than the other likely Weaknesses for the card ([L] as an alternate [W] Type Weakness or [F] from its secondary video game Typing). No Resistance is the worst Resistance, but a total lack of it is the norm. There is also something that might make it a bit too good for this card, but we’re not quite to that yet. The Retreat Cost of [C] is very good, even if Greninja (XY – BREAKpoint 40/122) had me hoping we might get yet another version with a perfect free Retreat Cost. Which finally brings us to what this Pokémon can actually do. Its Ability, “Evasion Jutsu”, triggers any time damage would be done to this Pokémon; you flip a coin, and if it is “heads”, that damage is prevented. The wording doesn’t make it optional, but most of the time you’ll want to try to avoid being damaged anyway. It only works against damage – not damage counter placement – but it doesn’t care whether the damage is coming from an attack by your opponent’s Pokémon or your own. It would work against things that do damage other than attacks, but I don’t think any examples of non-attack-based damage exist in the Standard or Expanded cardpools. Even with the few conditions, even only working on a coin flip, this Ability is phenomenal. How about the attack? “Furious Shurikens” requires [WW] to use and does 50 damage to two of your opponent’s Pokémon (you choose which ones). If one of those is the Active, Weakness/Resistance will still apply, but not for Benched targets unless you equip Greninja with a Wide Lens. 100 for two Energy is a good return, but being split between two targets means this Greninja can’t even handle some of the “glass cannons” we have in the Standard Format, like Jumpluff (SM – Lost Thunder 14/214). It would still be enough to take out ANY Hoppip or Natu (SM – Lost Thunder 87/214), however. Without the Ability, Furious Shurikens would be bad, but if you flip well, it is more than adequate. Kalos Starter Set 14/39: Yes, I forgot this version was a thing as well. It wasn’t every particularly good, and power creep has left it behind. XY 41/146: Still very good due to the damage counter-placing Ability, though the attack can be useful for low-HP, effect-based walls when its own Ability isn’t enough. If you aren’t familiar with the Ability, you do have to discard a [W] Energy from your hand in order to use it. XY: Black Star Promos XY24: The one [D] Type Greninja. This actually seems like the “prototype” for today’s version. Its Ability offers total protection from attacks made by your opponent’s Pokémon (damage and other effects) but the Ability only triggers when you manually Evolve into this Greninja. The attack does a 60/20 split for [DC]. Neither of these was enough to make it work back in the day and still don’t now. XY – BREAKpoint 39/122: This version has that perfect free Retreat and, an attack deals decent damage for a single Energy, but most importantly, an attack which does so-so damage but shuts off the Abilities of your opponent’s Pokémon during their turn. One of the reasons Greninja BREAK decks were competitive for so long, though the archetype might finally be obsolete now in Expanded. XY – Black Star Promos XY162: While it has a decent, single Energy spread attack that gave it the tiniest bit of time as plausible TecH in Greninja BREAK decks, like the very first Greninja released in the XY-era, there’s a reason this one is often forgotten. Wait, there’s more! 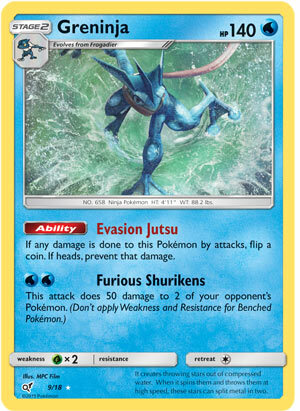 Expanded has Greninja BREAK, which can Evolve from regular versions of Greninja, keeping their bottom stats and effects while using its own 170 HP and adding its own Ability, “Giant Water Shuriken”, which places three damage counters on one of your opponent’s Pokémon when you use it. It is your typical once-per-turn, before-you-attack Ability though it also requires you discard a [W] Energy from your hand. In both Expanded and Standard, you have Greninja-GX (SM – Forbidden Light 24/131, 120/131, 133/131) and Greninja-GX (SM – Black Star Promos (SM197) as alternate Stage 2 options for the Evolution line. The original has yet another Ability which places damage counters on your opponent’s side of the field at the cost of discarding a [W] Energy from your hand, but this time it is SIX damage counters. Its “Haze Slash” attack lets it hit-and-run, sending itself back to your deck. There is a reasonably competitive deck built around spamming this card; you promote a Pokémon that can wall against your opponent (usually with a disruptive Ability as well), and Meganium lets you instantly re-Evolve into Greninja-GX (or any other Stage 2 in the deck) via its own Ability. We’ll be looking at the new Greninja-GX later and I need to wrap this up, so I’ll just say that it MIGHT provide a useful bit of draw, attack to deal with opposing walls, and budget GX-attack. The big concern is where does today’s Greninja fit into all of this? If you can “spam” it, you’ll have a small army of hard-to-KO troops. There is always a chance you’ll flip poorly, though, and the other catch there is that any other Pokémon you have in play, which includes Froakie and Frogadier, have no such protection. Your opponent can just bypass your protective Ability by targeting them. It might be a decent bit of TecH for established Greninja-GX and Greninja BREAK decks, where the drawback is the above plus giving up space for another regular Greninja (if the deck runs any). I am very curious what this might do in Expanded, with Greninja BREAK to sit atop it… but Garbodor (XY – BREAKpoint 57/122) and its “Garbotoxin” Ability mean you’ve got to deal with any that hit the field ASAP. Giratina (XY – Black Star Promos SM184) still counters this Greninja BREAK as well, regardless of which Greninja is under it. In the end, I am going to say that today’s Greninja has potential, but in a deck build around it. Open with Articuno (SM – Team Up 32/181) Active so you can safely manually Evolve Froakie into Frogadier (SM – Forbidden Light 23/131), and finally into today’s Greninja. Adding additional disruption (like Crushing Hammer) and healing (like Max Potion) so that, even when you flip “tails” for Evasion Jutsu, odds are good that Greninja isn’t being KO’d. This might turn into a pure wall deck, but I am thinking, especially with cards like Aqua Patch and Frogadier spreading damage counters, you will be attacking as well. Maybe even include Tapu Lele (SM – Black Star Promos SM45) or Tapu Lele (SM – Ultra Prism 94/156) plus the Energy it would need to attack. Once you’ve got enough damage on the board shift it all around for the KO’s needed to win. That’s all pure Theorymon at this point, however. If my hopes for Greninja seem high, please understand we’ve had at least one Stage 2 Pokémon with a similar protective effect do well in the past: Jumpluff (EX – Team Rocket Returns 11/109). Besides the actual differences in the protective effect, Jumpluff had a better attack, so it is still circumstantial evidence that this Greninja will work out as well.